Crafted from Rubberwood solids and Mango veneers, this queen panel headboard showcases rustic style elements. Featuring a planked panel design, the headboard is completed with a Rock Beaten Gray finish with saw cuts that will transform your bedroom setting. The Thornwood Hills King Panel Headboard by Liberty Furniture at Dinette Depot in the Brookfield, Danbury, Newington, Hartford, Connecticut area. Product availability may vary. Contact us for the most current availability on this product. Handles & Hardware Dark Antique Pewter hammered metal bar pulls. Drawer / Shelf Construction French and English dovetail construction. Drawer Suspension Full extension metal side glides. 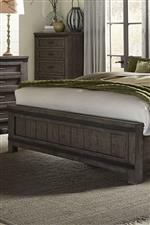 Highlighted by rustic and transitional style elements, the Thornwood Hills collection will accommodate all your bedroom needs. Crafted from Rubberwood solids and Mango veneers, the furnishings showcase dovetail drawers with full extension metal glides, bed footboard storage, fully stained interior drawers and top felt-lined drawers. 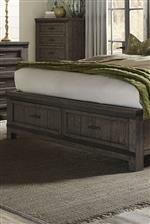 All completed with a Rock Beaten Gray finish with saw cuts, this rustic collection will add formal elegance to your bedroom setting. The Thornwood Hills collection is a great option if you are looking for furniture in the Brookfield, Danbury, Newington, Hartford, Connecticut area. Browse other items in the Thornwood Hills collection from Dinette Depot in the Brookfield, Danbury, Newington, Hartford, Connecticut area.